The Itty Bitty Kitty Committee: Thank You, Part Two! Here's the glorious moment in time when we cleared that $40 squillion hurdle! And as you can see, it's Miss Opal's five cents (a penny per kitten) that took us over the top! A huge thanks to G for having capturing this, and sending the picture to me!! Ok,, I'm not done thanking you yet. I need to give a big shout-out to some special folks that helped make our fundraiser such an unbelievable success. Thank you for being the fabulous women that you are, thanks for being a part of the team and thanks for bringing nice little chunk of change for the kitties! Thanks for being an awesome cheerleader. And thanks for crying happy tears all the time. You're the bestest. Thank you G for your fundraising expertise, and for inspiring me to set a higher goal. I appreciate your knowledge and know-how, and encouraging words along the way. Thank you dear, sweet little Opal for you generous, heart-felt, $1.05 donation. Thanks for showing us that every single penny counts. Thanks for inspiring so many to give. Thanks for loving kitties so much. Thank you for turning your sweet sixteen birthday party into an IBKC fundraiser. You're a special girl. Thanks to those who oh-so-generously bid on our kitty names, tea with the bean, and art. You guys rocked it! And you kitty namers, Nanette, Eleanor, Cynthia, and Christina,, nice work...you came up with some AWESOME choices. Alison, the Bean is looking forward to tea with you! Thanks for being the sweet, supportive husband you always are. Thanks for not complaining when other parts of our life got put on the back-burner during the fundraiser. Thank you too for the beautiful paintings you made, and gave. Where do I begin. Thank you for your generous spirit, enthusiasm, humor, and caring nature. You gave, and gave, and gave, and gave and your matching donations inspired others to do the same. I'm not so sure we wouldn't of hit our goal with out your support. Bless you and your kitty-lovin' ways. And thanks, once again, to all of you. Thanks for still stopping by everyday, and not tuning out during the fundraiser. Thanks for caring and giving so much. I know a lot of you who donated, do so much for cats and kittens already.. you foster, you blog about them, you volunteer at your local shelter... I appreciate the fact that you're so willing to give more than you already do. Thanks for spreading the word far and wide, and letting others know about what we were up to. Lots of new folks found their way to the blog, and lots of those folks made a contribution to our fundraiser. And finally, a huge thank you to everyone for the sweet, supportive words you've given throughout our campaign. Your kind comments kept me going through this long month. I appreciate you all so much. You are a loving community, and I am so happy to have you in my life. I hope I haven't forgotten anyone. If I have,, it's only because my heading is still spinning from all of this excitement. You are very welcome! Thank you for being a part of this, too! Thank YOU for doing so much for the kitties! This is from Jenna's mom, I am so proud of my sweet girl. She is an amazing person and is so happy that you wrote about her!! Thank you, that was the best birthday gift ever and we are going to scrapbook this blog entry! My mama, who was raised in an agricultural home in Germany in the 20's/30's, told me that HER mutti (mama) always taught her that care of the critters comes first -- i.e., feed the animals before you even think of feeding yourself. Amen to that. And thank you so very much for all that you do for all the critters out there. All that went before and then some! You are incredible for creating this fantastically warm, loving community. You are most certainly welcome, Laurie! I had been thinking about fostering for quite some time, but you have inspired me to work on making it a reality someday soon. And yay for adorable little Opal! Her sweet gesture touched me so much too. Opal!!! You rock!!! Yay!!! How exciting to be THE BIG ONE!!!! What a FANTASTIC achievement! YAY! Well done to yoo all. I would also like to single out and applaud Cynthia. 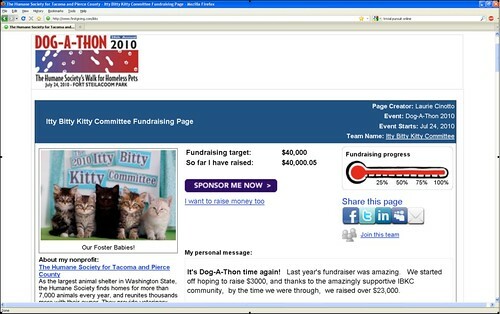 Several times I saw it announced that she would match donations and make one dollar count for two dollars up to $1,000. I am sure that served as a huge incentive for people to give. Outstanding Cynthia, just outstanding. Thank you! Opal: Your contribution made me cry --- in a good way. Laurie: Get some well-deserved rest. Cynthia: There's nothing more I can say that hasn't been said, except to add my praises to the others. Huzzah!